It's 00:03 in New Orleans, USA right now. 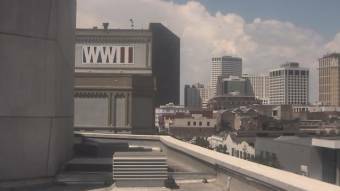 The National World War II Museum Webcam and current weather data - camera location: The National World War II Museum. New Orleans, Louisiana: Port of New Orleans, 0 miles away. New Orleans, Louisiana: Holy Cross School, 0 miles away. New Orleans, Louisiana: New Orleans Lakefront Airport, 0 miles away. Chalmette, Louisiana: Chalmette High School, 8.4 miles away. Kenner, Louisiana: Kenner Living Science Center, 8.7 miles away. Thibodaux, Louisiana: Thibodaux Regional Medical Center, 44.3 miles away. Thibodaux, Louisiana: Nicholls State University, 44.3 miles away. Houma, Louisiana: Terrebonne Parish OHigh SchoolEP, 44.4 miles away.